Hon’ble Union Minister for Human Resource Development, Smt. Smriti Zubin Irani dedicated ‘Prashikshak’ - a teacher education portal, to the nation at Vigyan Bhawan, in New Delhi today. ‘Prashikshak’ is launched with a vision to strengthen District Institutes of Education and Training (DIETs) and bring quality teachers into the Indian school education system. Prashikshak is a unique IT initiative, a first of its kind in the country, which will contain a comprehensive database of all DIETs in the country with all relevant performance indicators. It will help benchmark DIETs to enable aspiring teachers to make informed choices about their future. At the same time, it will give the opportunity to Central and State Governments to do real time monitoring of the institutions. Prashikshak was established through joint collaboration between Ministry of Human Resource Development and Central Square Foundation. 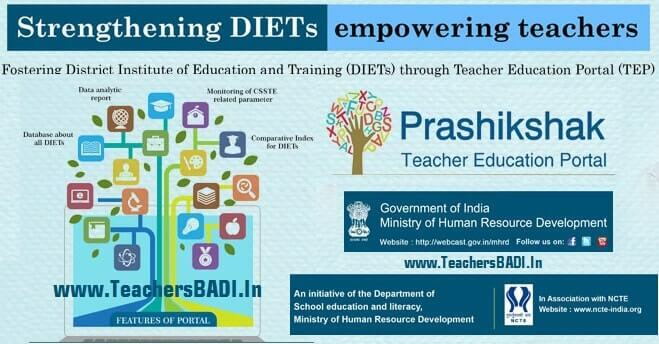 The objective of Prashikshak is to define quality benchmarks and help DIETs to make informed decisions about their institutes, compare the performance of their institute against other DIETs in the state/country as well as helping aspiring teachers make informed decision making. Teacher education system has seen a phenomenal expansion during the last two decades and today it is the single largest professional educational system in the country which turns out the highest number of ‘trained personnel’ for our schools. DIETs were created in the early 1990s to strengthen elementary education and support the decentralization of education to the district level, under the Centrally Sponsored Scheme on Teacher Education. DIETs offer pre-service and in-service teacher training programmes for government elementary school teachers. They also undertake studies in education, annual academic planning and reviews and function as resource centres for teaching learning and material development. As on 31.05.2016, 588 DIETs are functioning in the country with an annual intake capacity of 49026 students.